“Christmas should be an attitude toward life, not an endurance exercise. This Advent season, why not shop the scriptures rather than the malls to prepare.” Joan D. Chittester, O.S.B. 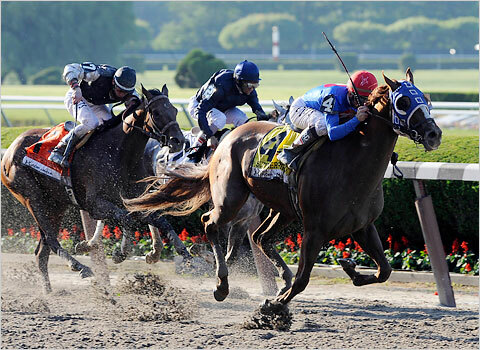 The 143rd Belmont Stakes – Are These Twelve Colts Who They Are? Yesterday I was aptly reminded in a timely conversation that we don’t exist. We just think we do. We have a really good idea of who we are and how we fit into the world. We know our strengths and weaknesses, our likes and dislikes, and our relative place in the world. And because of that, we feel comfortable making similar assessments about others, and operating based on those assessments. This makes for a well-defined but confined system – the degrees of freedom are limited by the pecking order we impose largely on ourselves. We are who we are. 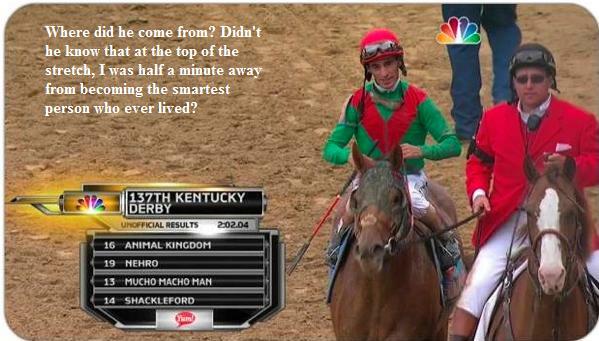 Johnny V and Animal Kingdom come flying past Nehro to ruin another perfect moment…. O horse racing! My love for you is unending. You fill my days with wonder, and haunt my dreams with tattered tales of what might have been, taunts of glory yet to come. But I have loved you with steady ardor and child-like hope, while you play with me like an upstaged toy, tossing me about from ecstasy to agony, promising me the perfect moment, and snatching it away with venomous glee. I love you, horse racing – why won’t you love me back? A wise friend recently told me this: Forgiveness, in its purest form, is abandoning all hope that you can have a different past. The importance of doing this cannot be understated – happiness, and purpose, have as their prerequisite a resolute commitment to looking forward at all times. But The Past, especially when She offered perfection and then twisted the script at the last moment, beckons us to sit with Her, and rehash the decisions, revisions, and omissions that could have changed everything. What a wonderful world we live in! 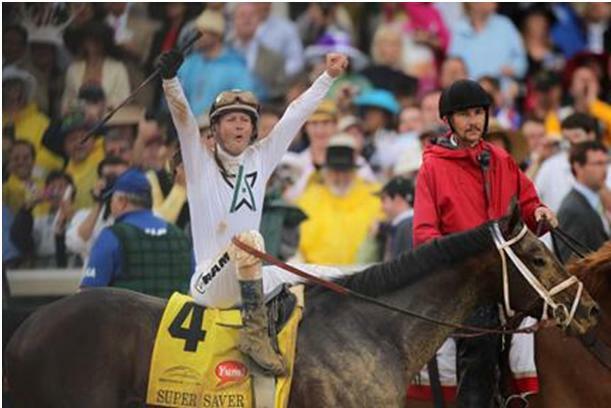 Calvin Borel rejoices aboard Super Saver after winning the 2010 Kentucky Derby. Calvin’s last 4 Derbies: First, Third, First, First. But he has his work cut out for him this year aboard Twice the Appeal. It has been said that the problem with life’s most important, game-changing moments is that so often, we don’t know that they are happening. We spend the rest of our lives lamenting our lack of vision, realizing that if only we had been awake at that magic juncture, we could have seized the day, and changed everything. Well let me tell you something, dear friends. That moment is coming on Saturday – two minutes of transcendent perfection, when 20 utterly mediocre 3-year-old thoroughbreds will lunge from the gate and send the fortunate few who are prepared into an impossible state of electric ecstasy. And I am taking a stand for you, right now, right this very moment. I will not let you walk into that nexus of perfection unprepared. You WILL be ready. You will “be there”. My campaign for Congress is officially over, and here’s the wrap-up. Drosselmeyer? Is that a horse or some sort of Bavarian pastry? Sheesh. I guess I should have known that a horse named Ice Box wouldn’t care for the heat. Anyone who listens to me gets what they deserve.